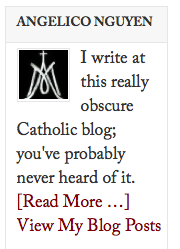 You are here: Home / Nguyen / Hipster Catholics, blogging at a time near the end of the world. We were drinking pbr back when it was still uncool and posting on Godsbody. I hear PBR goes better than Heineken with nitrous oxide. and now its time for another incongrous necrocomment. So I wrote a post for this blog, riffing on another site, about a certain author. 1) Your latest for Unpleasant Accents does justice to both a) The Toast‘s ‘How to Tell What Novel You’re In’ series, and b) Dr Percy’s body of work; I read it with great enjoyment this morning. Well done, sir. 2) Thank you very much for the invitation to receive an invitation to Ello. I shall be pleased indeed — not to mention grateful — to take you up on that offer, give Ello a try, and join you in claiming a new chunk of cyberspace for Our Lord. At least until it gets too mainstream. One of the creepier privileges that full-fledged members of the Korrektiv Kollektiv enjoy is the ability to peep the addresses that you commenters type in the ‘Email’ blank of the comment form. If you’d be OK with my emailing you at the address you used to enter the above comment, let me know. In any case, thanks for the kind invite. And thanks for doing right by Uncle Walker at Unpleasant Accents! SWM is a favorite in Viennese coffee houses Baltic union halls. Do they read it in the original English? Still eager to hear Maureen Corrigan’s review on Fresh Air.